The Witches Falls section of Tamborine National Park in the Gold Coast Hinterland was gazetted on 28th March 1908, making it Queensland's first national park. It is the third oldest national park in the world. 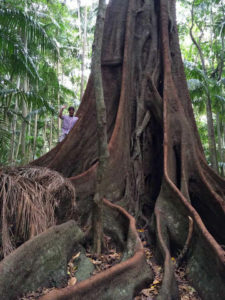 Additional reserves have been added since 1908 and today the park is made up of 13 sections of land covering the plateau and down to the foothills of Tamborine Mountain. 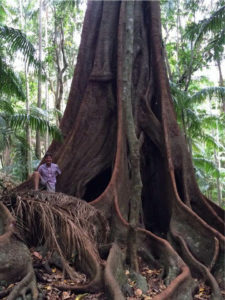 Unique plant communities are protected including magnificent rainforest with distinctive piccabeen palm groves, wet eucalypt forest with tall flooded gums, open forest with bracken fern understorey and woodland. Tamborine Mountain escarpment contains 85 percent of all fauna species and 65 percent of all flora species in the Gold Coast City area. The park is home to many rainforest animals including the rare Albert's lyrebird and one of the world's largest skinks, the land mullet. The Richmond Birdwing butterfly and noisy pitta migrate seasonally to the park. Tamborine Mountain is the most northerly remnant of the flows from a volcano centred on Mt Warning which erupted violently 23 million years ago. Basalt columns, cliffs, rocky outcrops, steep escarpments and waterfalls are geographical features. The Queensland Parks and Wildlife Service (QPWS) is continually improving tracks and visitor facilities in Tamborine National Park, to enhance your visit to this unique environment. To protect the natural values of this park, camping is not permitted within the national park. 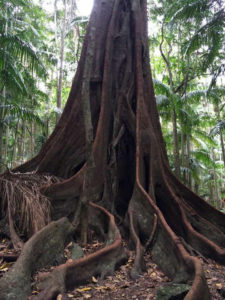 From your private Witches Falls Cottages accommodation you can just wander across the road to the Witches Falls Section of the Tamborine Mountain National Park and disappear into a different world. Why not set off early on one of the two walking tracks and build yourself a hearty appetite for a tasty, generous Witches Falls Cottages Breakfast (with yummy freshly baked bread) delivered in a hamper right to your door. This track zigzags down the steep mountainside through open forest with banksia trees and into rainforest with huge strangler figs. You will pass seasonal lagoons surrounded by piccabeen palm groves and rainforest before you reach Witches Falls. After heavy rain the lagoons fill with water and come to life with many species of insects and frogs. The track returns through rainforest and behind the cemetery. The falls only flow after recent rain and can be viewed via a 200m detour from the circuit to a lookout platform. This track also starts from the picnic area on Main Western Road. The walk descends through rainforest to Witches Falls and continues along the cliff to Witches Chase, passing through rainforest with large red cedar trees and through eucalypt forest. From here, the Witches Falls car park is 2.7km via the Beacon and Main Western Roads. Please view a printable Map of all Walking Tracks.